Optical design is a balancing act involving trade-offs. Many high-resolution industrial lenses, like the Ultra-Micro-Nikkors and their relatives, achieve exceptional field flatness and resolution across their large image circles, but in order to achieve such perfection, they give up on correcting some chromatic aberrations. These lenses perform best with monochromatic light. Many of these lenses are designed to use the strong emission lines of mercury as their light source. These lens designs expect light wavelengths to vary by only a few nanometers from the nominal peak wavelength of the emission line they are designed to use. More recent photolithography lenses expect laser light, with wavelength variation of only a few picometers. If we want to use any of these lenses for photography, we need to use monochromatic light. The best source of such light nowadays is a laser of the appropriate wavelength. 435nm lasers are readily available that are close to the g-line of mercury (436nm), the most common wavelength optimization for photolithography lenses of the early and mid 1980s. The i-line (405nm) is also covered by commonly available lasers. The h-line (546nm) is not covered, as far as I know, but there are many 532nm lasers which might be close enough. But there is a problem with using lasers for photography. 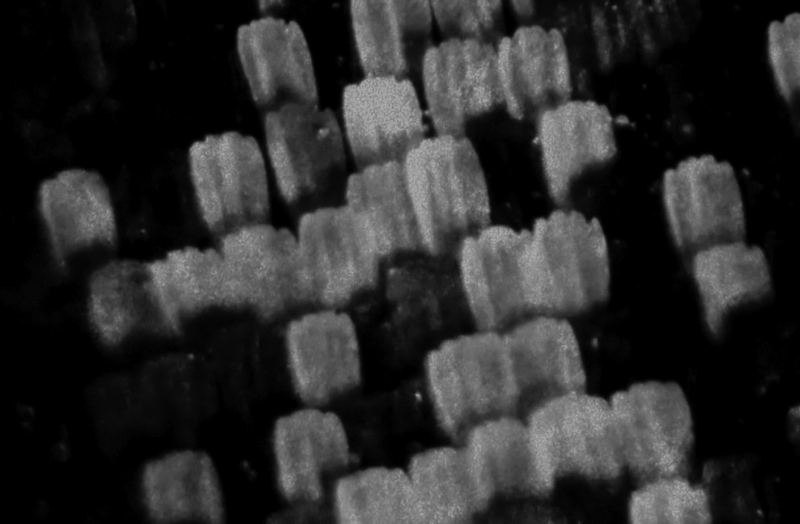 Coherent light interferes with itself to produce standing waves that make speckle patterns on the surface being photographed, making a horrible mess of the image. This happens even if the light is highly diffused by ordinary diffusers. The solution is simple- move the light slightly during the exposure so that the speckle pattern moves around and minima and maxima average out. Companies like Optotune (http://www.optotune.com/index.php/products/laser-speckle-reducers) recently invented laser de-specklers which are basically microscopically vibrating filters, but these cost between $500-1000. In keeping with the spirit of this forum, it would be nice to have a cheap do-it-yourself solution. One of the useful random facts I learned during my aborted physics education in the 1980s was that we could get rid of speckle patterns in our dye lasers by passing the laser beam through dilute milk. The big fat macromolecules in the milk are constantly moving by Brownian motion. Because these scattering particles are in fast motion, the speckle pattern in the scattered light changes so fast that it gets averaged out by slow detectors like the human eye or a normal photographic exposure. I've just succeeded in applying this to de-speckling my 435nm lasers, and it makes clean photos. I fill a transparent film canister with a dilute solution of powdered milk, and shine three lasers into the canister. (Having many lasers also helps average out the speckle patterns, since each laser makes an independent pattern.) The milk is the light source. I put aluminum foil around the side of the canister facing away from the subject, to increase the amount of light going towards the subject. Don't use paper for this, since paper fluoresces. This technique eliminates the problem of chromatic aberration for monochrome photography. 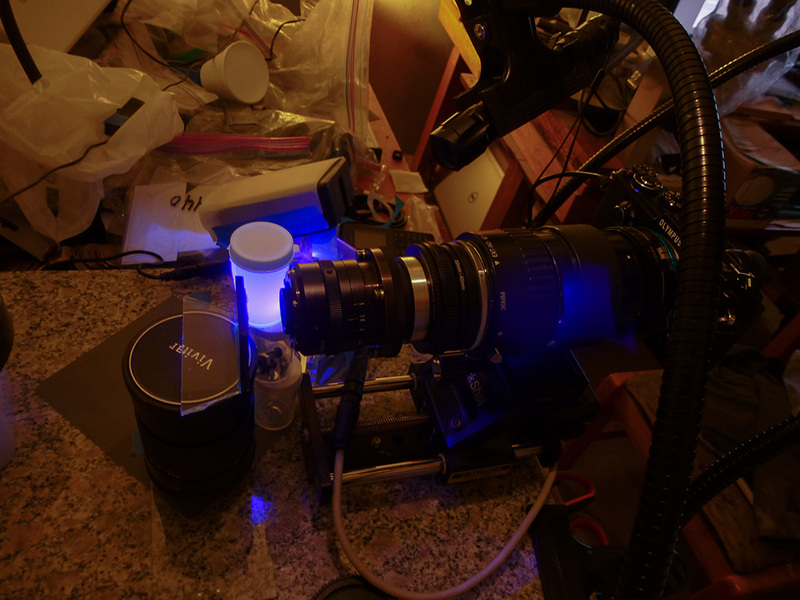 The next step is to use a monochrome camera, instead of a camera with a Bayer sensor which throws away 3/4 of the pixels when a blue laser light is the light source. I will post on that shortly. - shining it through a spinning diffuser. Have you considered modulating the laser, basically turning it on and off very quickly, much faster than the exposure period? In essence this would slightly frequency (~1/wavelength) modulate the laser, in addition to the obvious amplitude modulation. The frequency modulation would slightly spread the laser spectrum and possibly reduce the standing waves due to the highly coherent laser wavelength. Along this line of thinking (pun intended ) modulating the laser bias with a time varying waveform (sine, triangle) such that the total laser bias is the sum of the time varying and DC bias also might work, maybe better. We in the electronics field go to great lengths to make our electronic oscillators independent of amplitude & bias & temperature, so I suspect that diode lasers might have a very slight frequency/wavelength dependance on bias (and temperature) which could be exploited. BTW I'm sure you know about the monochromatic cameras that SBIG has for astro use, you might find an older one on eBay. Thanks for the post, very interesting indeed!! Pau, I did buy some colored LEDs and some interference filters, but the lasers are more monochromatic than the LEDs, and the interference filters are very small and hard to align properly. A spinning diffuser would work but would be a source of vibrations. 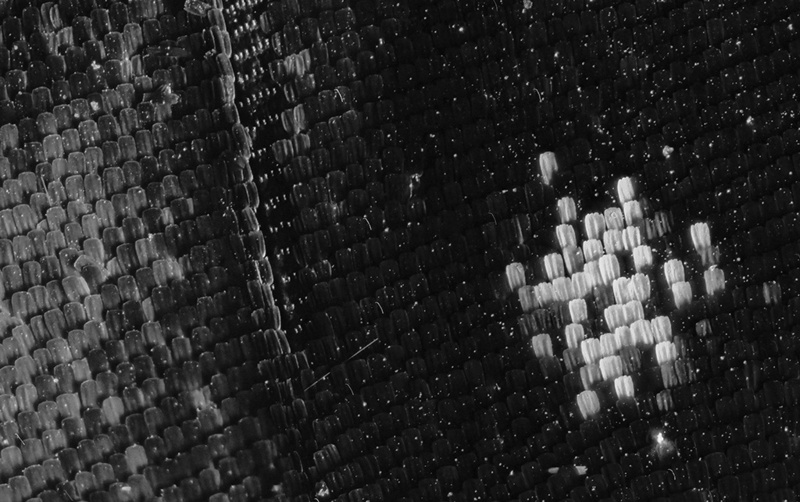 A stationary random reflector like paper still makes a noticeable speckle pattern since the reflected light is still coherent. For regular lenses, green light would be preferable, not only because it doesn't cause much fluorescence but also because it wastes only half the sensor's pixels instead of wasting 75% of them. 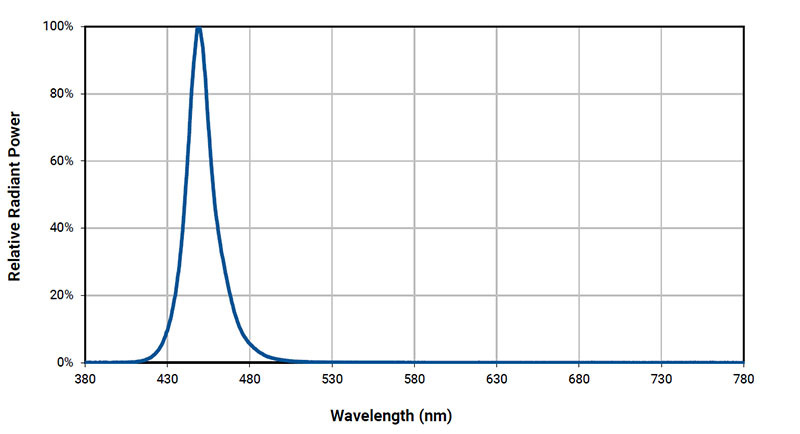 But the more modern special lenses optimized for single wavelengths are usually optimized for blue or UV. I was able to find one or two old Russian lithography lenses that are optimized for green and will try them today. ChrisR, I'll do a control experiment tonight when it gets dark. Mike, that's a very interesting suggestion and would be easy for someone with your skills. I don't know enough to go that route, unfortunately. I have a new QHY163 monochrome camera with cooled sensor which I hope to try for the first time today if time allows. I'm thinking on microscope fluorescence filters, there are different sizes being the most usual 25mm diameter, a LED or a laser are much smaller! They are meant to work perpendicular to the light and here the angle issue will arise if you don't use collimating optics like in a fluorescence microscope as they change color with the angle. Narrow band filters have little transmission so they will cut lots of light. Are you special optics so much exigent to work with a very narrow wavelength spectrum? Pau, yes, the perpendicularity is my problem with these tiny filters (mine are about 1cm wide). The older Zeiss photolithography lenses are rated at +/- 5 nm according to Zeiss but it may not be as critical for my applications as it would be for photolithography. The newer ones are rated as +/- a few picometers. ... did you give the monochrome camera a try yet? No, there was no time. It is quite involved. I have to download and learn various new programs for this, but I have a lot of other work that gets in the way...Maybe tonight.